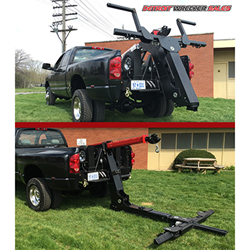 Detroit Wrecker Sales is excited to announce the official launch of The Gladiator, the strongest and most durable ‘in the bed’ repo unit ever. There is no other unit on the market with our Lifetime Warranty on Pins, Bushings, & Craftsmanship. The benefits of having a wheel lift mounted in the bed of a pickup truck are significant. These units are much cheaper than buying a light duty wrecker, capable of fitting into places other equipment cannot, and can be outfitted just like a much more expensive wrecker body. In bed units are judged for their ability to tow any size car, pickup truck, or SUV ability to disperse weight over the rear axle on the truck. What Sets The Gladiator Apart From Other ‘In Bed’ Repo Units? The Gladiator units are outfitted at every pivot point with our long-lasting Bronze Oil-Lite Bushings and Pins for extra strength and reliability. All of the Pins and Bushings come with a lifetime warranty and are made to sweat oil in order to reduce rust, corrosion and overall maintenance. Every critical pivot point on the Gladiator has the ability to be tightened over time so that the unit never becomes loose. Some units can be shaken by the touch of the crossbar and we do not want the unit to share those symptoms in the future causing major repair. The Gladiator has steel hydraulic lines which eliminates the need to ever dismantle the entire piece of equipment to change a hose. Many other units fall victim to that repair and ours does not. There are short hoses running to the cylinders and the power unit however all are simple and within reach to replace very quickly and get you back on the road. The huge subframe included on this repo unit is not only massive, but it’s incredibly strong and powerful. As a result, it causes weight to evenly disperse throughout the entire bed of the truck. This actively protects your truck frame from over loading and breaking. The Gladiator can be shipped all over the country with extensive how-to installation guides. The Gladiator was designed to have one of the most simple installations ever. There are attachment angles that are the full length of the unit therefore the unit can be bolted to the most convenient spot, not trying to modify suspension or gas tank locations. The frame of the unit will match the width of your truck and as a result you get to enjoy simple and fast installation. There is an optional integrated bumper for the Gladiator which simplifies installation even more and complements the functionality of the unit. The bumper eliminates the need to notch the factory bumper or modify it in any way. The bumper has safety chain storage, license plate mount and light, and LED work lights. A unique dolly storage system allows the customer to easily roll the dollies into the bed and roll them out. There is no climbing over the side of the bed or trying to hold the dollies in the air to get them onto the mounts. They can also be locked into place for added security. Very simple and saves lots of time and energy. When it comes to personalizing the unit, the possibilities are endless! Every Gladiator comes sandblasted with any powder color the customer requests. Match company colors, pick something catchy, or go with a dirt-resistant shade. The Gladiator is built strong to handle the toughest jobs with ease and efficiency. The Gladiator has 4,500 pounds of lifting capacity and 9,000 pounds of towing capacity. No other ‘in bed’ repo unit offers the option to add on a boom (hydraulic or manual) and winch. These additions make your job easier, and increase overall capabilities. The unit includes a 100-foot cable with every boom and winch package. The boom extends and retracts the cable, allowing the customer to guide it wherever you need to recover something. The addition of the winch allows customers to utilize recovery in just about any situation. For instance, if a customer needs to move a car parked between a house and a sidewall they are able to get in there in ways one never could with a cumbersome tow truck. Plus, you don’t have to remove the boom when it comes time for service. What Does The Gladiator Cost & How To Order One? Orders are already being accepted for The Gladiator Wheel Lift and customers can call today to schedule an install or arrange to have one shipped directly to their door. Click Here to order today. Contact Detroit Wrecker Sales today to learn more about The Gladiator Wheel Lift. The unit can expand the towing capabilities and reduce maintenance costs for many companies in the Repo Industry! Click Here for Detroit Wrecker Sales contact information.